For those who enjoy the products of luxury brands and are looking for a large bag that can be used daily, this model could be good. 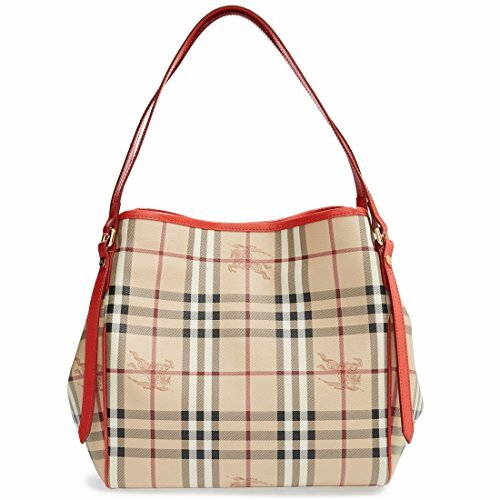 It is a medium-sized bag (10 1/2 “W x 10” H x 8 “D) which is worn over the shoulder of the famous British brand Burberry. Fantasy proposal is perhaps the most widely used and known in the ceck Burberry tartan which offers, in addition to the classic version as this one, numerous variants. The fantasy is easily coordinated not only with the clothes and the classic waterproof that reproduce this pattern in the lining, but also many accessories such as shoes, scarves, hats, umbrellas and so on. The bag is mainly made of coated canvas and has double leather handles of red coral that give a cheerful tone and original a classic set. The metallic finishes are golden and close with a magnetic button. The interior cotton lining has a zippered pocket and is removable, and can be used separately. It is attached to the bag via two handy machines.